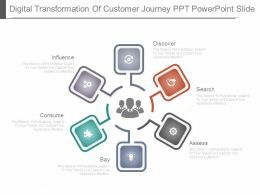 Presenting customer journey mapping icon ppt templates. 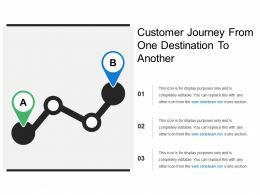 This is a customer journey mapping icon ppt templates. This is a five stage process. The stages in this process are customer journey icon, customer experience icon, customer loyalty icon. 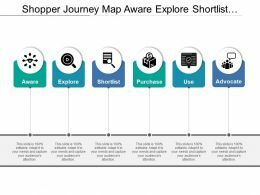 Presenting this set of slides with name - Shopper Journey Map Aware Explore Shortlist Purchase Use Advocate. This is a six stage process. The stages in this process are Shopper Journey, User Experience, User Journey. 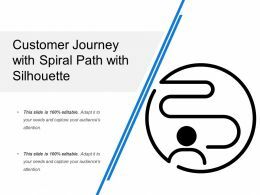 Presenting this set of slides with name - Customer Journey With Spiral Path With Silhouette. This is a one stage process. The stages in this process are Customer Journey Icon, Customer Experience Icon, Customer Loyalty Icon. 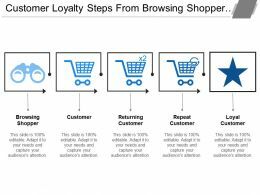 Presenting this set of slides with name - Customer Loyalty Steps From Browsing Shopper Customer. This is a five stage process. The stages in this process are Customer Experience, Customer Loyalty, Customer Journey. 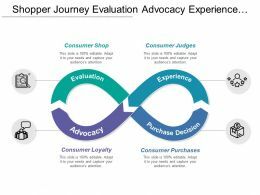 Presenting this set of slides with name - Shopper Journey Evaluation Advocacy Experience Purchase Decision. This is a four stage process. The stages in this process are Shopper Journey, User Experience, User Journey. Presenting customer journey icons ppt slides. This is a customer journey icons ppt slides. This is a six stage process. The stages in this process are customer journey icon, customer experience icon, customer loyalty icon. 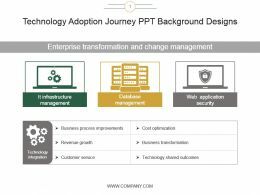 Presenting customer journey changing process ppt sample file. 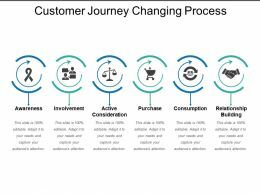 This is a customer journey changing process ppt sample file. This is a six stage process. The stages in this process are customer journey icon, customer experience icon, customer loyalty icon. 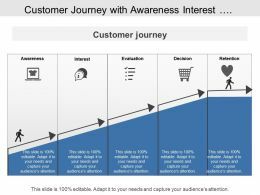 Presenting this set of slides with name - Shopper Journey Customer Awareness Interest Desire Action. This is a four stage process. The stages in this process are Shopper Journey, User Experience, User Journey. Presenting customer journey map icons ppt summary. This is a customer journey map icons ppt summary. This is a nine stage process. 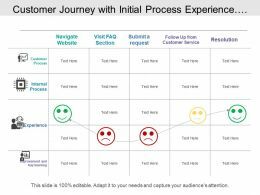 The stages in this process are customer journey icon, customer experience icon, customer loyalty icon. 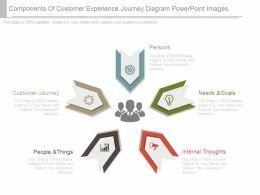 Presenting digital customer journey icon sample ppt files. 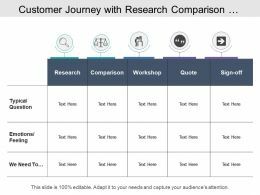 This is a digital customer journey icon sample ppt files. This is a five stage process. The stages in this process are customer journey icon, customer experience icon, customer loyalty icon. Presenting customer journey icon mapping example ppt slide styles. This is a customer journey icon mapping example ppt slide styles. This is a four stage process. The stages in this process are customer journey icon, customer experience icon, customer loyalty icon. Presenting this set of slides with name - Customer Experience Improvement Identify Measure Process Journey With Icons. This is a four stage process. The stages in this process are Process Journey, Process Mapping, Process Cycle. 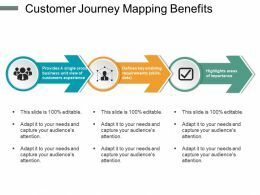 Presenting customer journey icon for customer success ppt slide. This is a customer journey icon for customer success ppt slide. This is a seven stage process. The stages in this process are customer journey icon, customer experience icon, customer loyalty icon. Presenting customer experience example of ppt. This is a customer experience example of ppt. This is a five stage process. 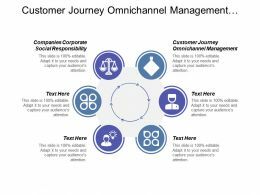 The stages in this process are customer communication testing, customer experience, advertising research, industry and competitive analysis, market segmentation. Presenting customer journey icon buying process ppt samples. 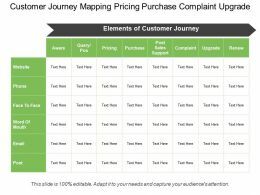 This is a customer journey icon buying process ppt samples. This is a five stage process. The stages in this process are customer journey icon, customer experience icon, customer loyalty icon. 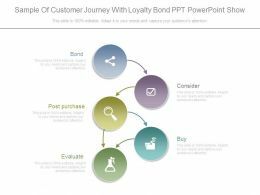 Presenting sample of customer journey with loyalty bond ppt powerpoint show. 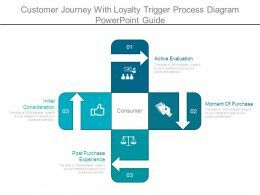 This is a sample of customer journey with loyalty bond ppt powerpoint show. This is a five stage process. The stages in this process are bond, consider, buy, evaluate, post purchase. 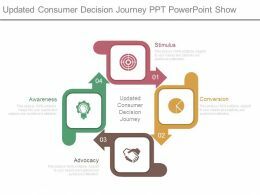 Presenting customer journey icon for engagement process ppt slide show. This is a customer journey icon for engagement process ppt slide show. This is a three stage process. The stages in this process are customer journey icon, customer experience icon, customer loyalty icon. 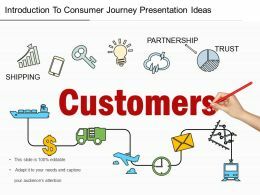 Presenting customer journey icons for purchase process ppt slide themes. 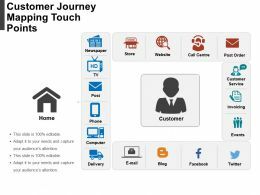 This is a customer journey icons for purchase process ppt slide themes. This is a eight stage process. The stages in this process are customer journey icon, customer experience icon, customer loyalty icon. Presenting customer journey mapping icons presentation deck. 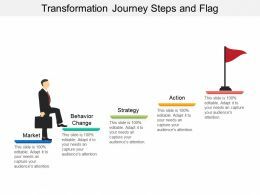 This is a customer journey mapping icons presentation deck. This is a five stage process. The stages in this process are customer journey icon, customer experience icon, customer loyalty icon. 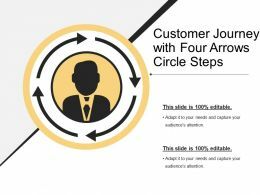 Presenting this set of slides with name - Customer Journey With Four Arrows Circle Steps. This is a four stage process. The stages in this process are Customer Journey Icon, Customer Experience Icon, Customer Loyalty Icon. Presenting this set of slides with name - Customer Journey From One Destination To Another. This is a two stage process. The stages in this process are Customer Journey Icon, Customer Experience Icon, Customer Loyalty Icon. 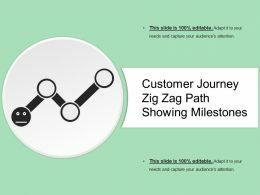 Presenting this set of slides with name - Customer Journey Zig Zag Path Showing Milestones. This is a three stage process. The stages in this process are Customer Journey Icon, Customer Experience Icon, Customer Loyalty Icon. Presenting this set of slides with name - Customer Journey With Awareness Consideration. This is a five stage process. 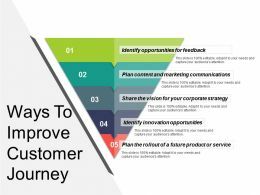 The stages in this process are Customer Experience, Customer Loyalty, Customer Journey. 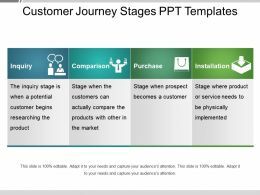 Presenting customer journey stages ppt templates. 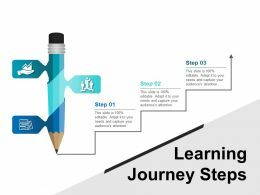 This is a customer journey stages ppt templates. This is a four stage process. The stages in this process are user experience, user loyalty, user journey. 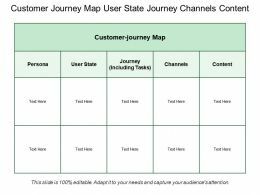 Presenting this set of slides with name - Customer Journey Map User State Journey Channels Content. This is a five stage process. The stages in this process are User Experience, User Loyalty, User Journey. 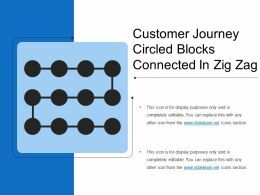 Presenting this set of slides with name - Customer Journey Circled Blocks Connected In Zig Zag. This is a two stage process. The stages in this process are Customer Journey Icon, Customer Experience Icon, Customer Loyalty Icon. Presenting customer journey mapping touch points ppt infographics. 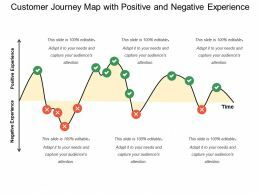 This is a customer journey mapping touch points ppt infographics. This is a four stage process. The stages in this process are customer touch points, customer services, customer experience. Presenting this set of slides with name - Customer Journey With Initial Process Experience. This is a five stage process. The stages in this process are Customer Experience, Customer Loyalty, Customer Journey. 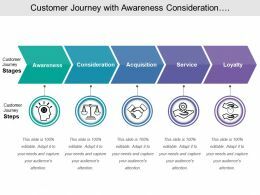 Presenting this set of slides with name - Customer Journey With Awareness Interest Evaluation. This is a five stage process. The stages in this process are Customer Experience, Customer Loyalty, Customer Journey. 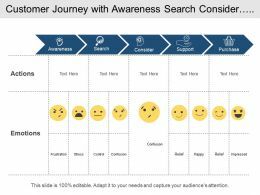 Presenting this set of slides with name - Customer Journey With Awareness Search Consider. This is a five stage process. The stages in this process are Customer Experience, Customer Loyalty, Customer Journey. Presenting this set of slides with name - Customer Journey With Interest Search Research. This is a five stage process. The stages in this process are Customer Experience, Customer Loyalty, Customer Journey. Presenting components of customer journey ppt sample file. 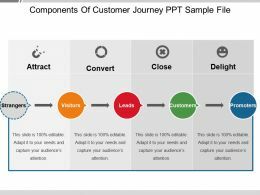 This is a components of customer journey ppt sample file. This is a four stage process. The stages in this process are user experience, user loyalty, user journey. 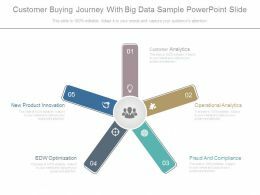 Presenting customer journey buying cycle ppt samples. 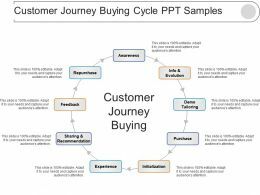 This is a customer journey buying cycle ppt samples. This is a nine stage process. The stages in this process are user experience, user loyalty, user journey. Presenting customer journey challenges and solutions ppt slide. 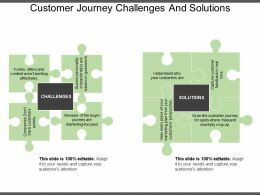 This is a customer journey challenges and solutions ppt slide. This is a two stage process. The stages in this process are user experience, user loyalty, user journey. Presenting customer journey cycle ppt slide design. 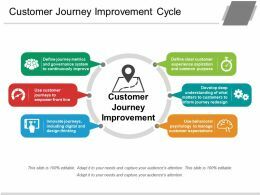 This is a customer journey cycle ppt slide design. This is a five stage process. The stages in this process are user experience, user loyalty, user journey. 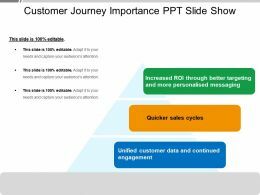 Presenting customer journey importance ppt slide show. 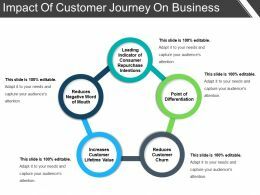 This is a customer journey importance ppt slide show. This is a three stage process. The stages in this process are user experience, user loyalty, user journey. Presenting customer journey improvement cycle ppt slide styles. This is a customer journey improvement cycle ppt slide styles. This is a six stage process. The stages in this process are user experience, user loyalty, user journey. 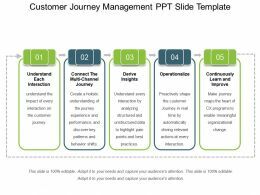 Presenting customer journey management ppt slide template. 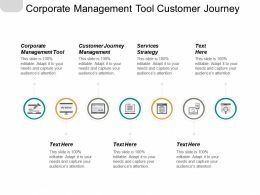 This is a customer journey management ppt slide template. This is a five stage process. The stages in this process are user experience, user loyalty, user journey. Presenting customer journey mapping benefits ppt slides. 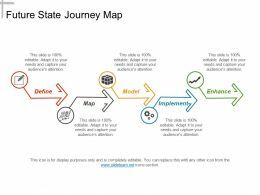 This is a customer journey mapping benefits ppt slides. This is a three stage process. The stages in this process are user experience, user loyalty, user journey. 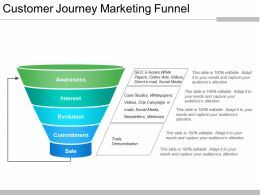 Presenting customer journey marketing funnel ppt slides download. 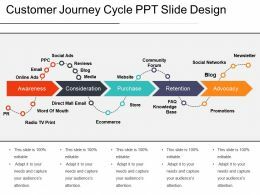 This is a customer journey marketing funnel ppt slides download. This is a funnel stage process. The stages in this process are user experience, user loyalty, user journey. 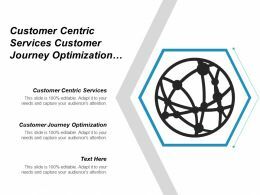 Presenting dynamic or changing customer journey presentation design. 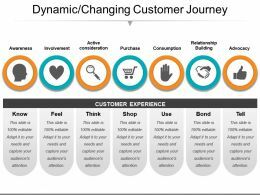 This is a dynamic or changing customer journey presentation design. This is a seven stage process. The stages in this process are user experience, user loyalty, user journey. Presenting ways to improve customer journey presentation images. This is a ways to improve customer journey presentation images. This is a five stage process. The stages in this process are user experience, user loyalty, user journey. 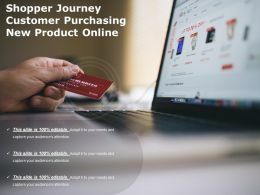 Presenting this set of slides with name - Shopper Journey Customer Purchasing New Product Online. This is a one stage process. The stages in this process are Shopper Journey, User Experience, User Journey. Presenting this set of slides with name - Customer Journey Mapping Pricing Purchase Complaint Upgrade. This is a eight stage process. The stages in this process are User Experience, User Loyalty, User Journey. 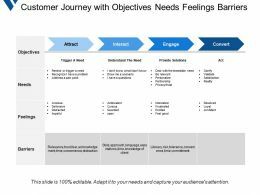 Presenting this set of slides with name - Customer Journey With Objectives Needs Feelings Barriers. This is a four stage process. The stages in this process are User Experience, User Loyalty, User Journey. 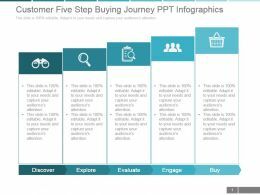 Presenting customer five step buying journey ppt infographics. 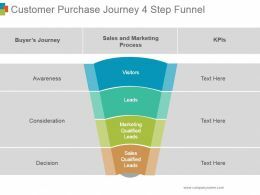 This is a customer five step buying journey ppt infographics. This is a five stage process. The stages in this process are discover, explore, evaluate, engage, buy. 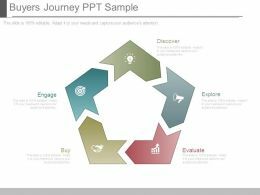 Presenting buyers journey ppt sample. This is a buyers journey ppt sample. This is a five stage process. The stages in this process are discover, explore, evaluate, buy, engage. Presenting this set of slides with name - Customer Journey With Research Comparison Workshop Quote And Sign Off. This is a five stage process. 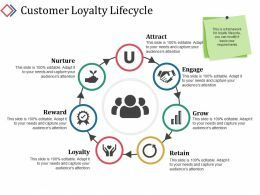 The stages in this process are Customer Experience, Customer Loyalty, Customer Journey. Presenting customer journey model for effective communication ppt summary. 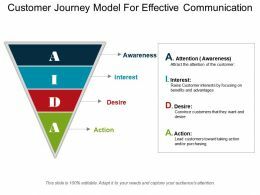 This is a customer journey model for effective communication ppt summary. This is a four stage process. The stages in this process are user experience, user loyalty, user journey. Presenting impact of customer journey on business presentation examples. This is a impact of customer journey on business presentation examples. This is a five stage process. The stages in this process are user experience, user loyalty, user journey. 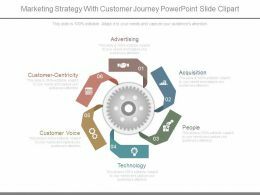 Presenting marketing strategy with customer journey powerpoint slide clipart. 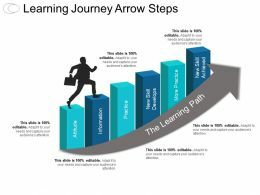 This is a marketing strategy with customer journey powerpoint slide clipart. This is a six stage process. The stages in this process are advertising, acquisition, people, technology, customer voice, customer centricity. 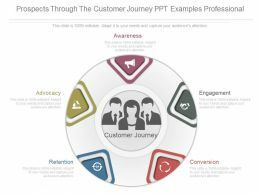 Presenting prospects through the customer journey ppt examples professional. 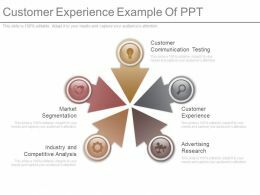 This is a prospects through the customer journey ppt examples professional. This is a five stage process. 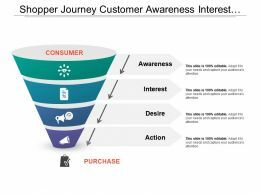 The stages in this process are awareness, engagement, conversion, retention, advocacy. 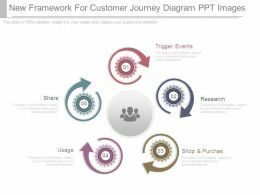 Presenting new framework for customer journey diagram ppt images. 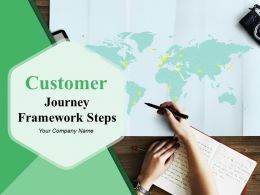 This is a new framework for customer journey diagram ppt images. This is a five stage process. The stages in this process are share, usage, trigger events, research, shop and purchas. Presenting this set of slides with name - Customer Journey Map With Positive And Negative Experience. This is a six stage process. The stages in this process are User Experience, User Loyalty, User Journey. 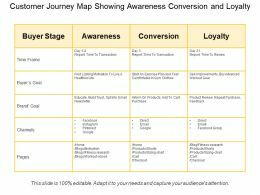 Presenting this set of slides with name - Customer Journey Map Showing Awareness Conversion And Loyalty. This is a three stage process. The stages in this process are User Experience, User Loyalty, User Journey. 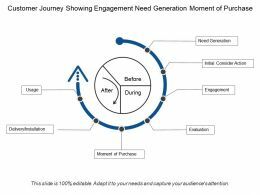 Presenting this set of slides with name - Customer Journey Showing Engagement Need Generation Moment Of Purchase. This is a seven stage process. The stages in this process are User Experience, User Loyalty, User Journey. 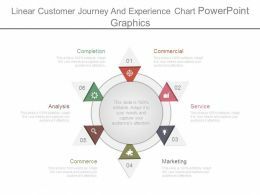 Presenting linear customer journey and experience chart powerpoint graphics. 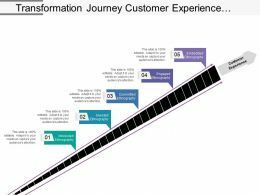 This is a linear customer journey and experience chart powerpoint graphics. This is a six stage process. The stages in this process are commercial, service, marketing, commerce, analysis, completion. 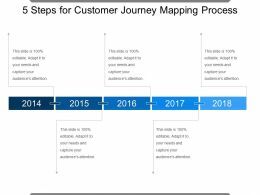 Presenting 5 steps for customer journey mapping process ppt slide show. 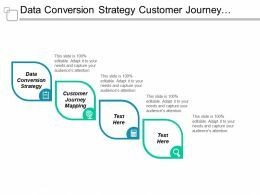 This is a 5 steps for customer journey mapping process ppt slide show. This is a five stage process. The stages in this process are 5 steps approach. Presenting example of customer engagement journey diagram powerpoint layout. 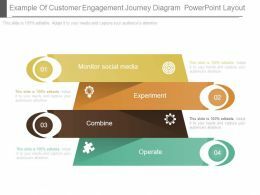 This is a example of customer engagement journey diagram powerpoint layout. This is a four stage process. The stages in this process are monitor social media, experiment, operate, combine. 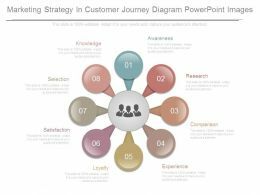 Presenting 5 steps for customer journey mapping process powerpoint guide. 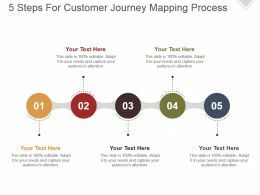 This is a 5 steps for customer journey mapping process powerpoint guide. This is a five stage process. The stages in this process are 5 step approach, 5 step process, 5 step plan. 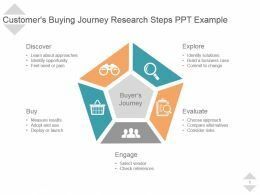 Presenting customers buying journey research steps ppt example. 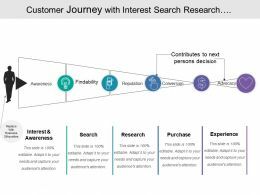 Presenting customers buying journey research steps ppt example. 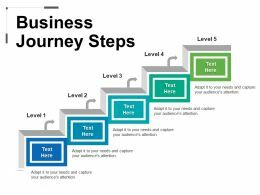 This is a customers buying journey research steps ppt example. This is five stage process. The stages in this process are discover, explore, evaluate, buy, engage. 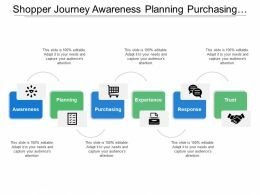 Presenting this set of slides with name - Shopper Journey Awareness Planning Purchasing Experience. This is a six stage process. The stages in this process are Shopper Journey, User Experience, User Journey. Presenting this set of slides with name - Shopper Journey Men Sharing Shopping Experience. This is a two stage process. The stages in this process are Shopper Journey, User Experience, User Journey. Presenting introduction to consumer journey presentation ideas. 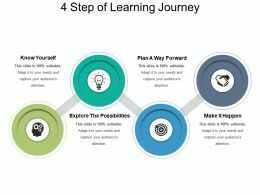 This is a introduction to consumer journey presentation ideas. This is a one stage process. The stages in this process are user experience, user loyalty, user journey. 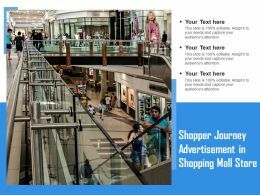 Presenting this set of slides with name - Shopper Journey Advertisement In Shopping Mall Store. This is a one stage process. The stages in this process are Shopper Journey, User Experience, User Journey. 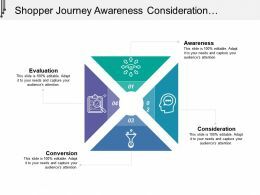 Presenting this set of slides with name - Shopper Journey Awareness Consideration Conversion Evaluation. This is a four stage process. The stages in this process are Shopper Journey, User Experience, User Journey. 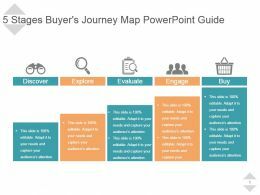 Presenting 5 stages buyers journey map powerpoint guide. Presenting 5 stages buyers journey map powerpoint guide. 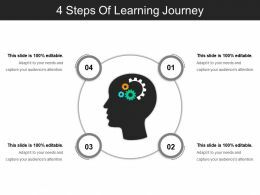 This is a 5 stages buyers journey map powerpoint guide. This is five stage process. The stages in this process are discover, explore, evaluate, engage, buy. Presenting customer problem icon layout. This is a customer problem icon layout. This is a one stage process. The stages in this process are customer problem, customer complaint, customer services. Presenting customer service icon 11. This is a customer service icon 11. This is a two stage process. The stages in this process are customer service icon, user service icon, client service icon. Presenting customer service icon template. This is a customer service icon template. This is a four stage process. The stages in this process are customer service icon, user service icon, client service icon. Presenting customer service icon vector. This is a customer service icon vector. This is a five stage process. The stages in this process are customer service icon, user service icon, client service icon. Presenting customer service relationship icon. This is a customer service relationship icon. This is a two stage process. The stages in this process are customer service icon, user service icon, client service icon. Presenting this set of slides with name - Customer Reference Icon. This is a two stage process. The stages in this process are Customer References, Customer Testimonials, Client Reviews. Presenting this set of slides with name - Customer Feedback Icon. This is a five stage process. The stages in this process are Business Feedback, Customer Feedback, Customer Testimonial.